That Cherie Bennett’s absorbing drama is called Anne Frank and Me gives only the first hint that the past is not, after all, ancient history. And Nicole Burns’ time travel from a modern-day American high school to France and Poland nearly 60 years earlier has a surprising resonance for 2011 audiences – audiences who may go in believing that the Holocaust never happened or that what took place in “ancient history” will never occur again. Even for teenagers who have read Frank’s Diary of a Young Girl, or who have paid attention to their history lessons, Anne Frank and Me is likely to hit closer to home than they expect. It’s in the way Bennett begins her play innocuously, with a teenage girl who has a lot less interest in studying than she does in winning the affections of a boy in her class. And it’s in the subtle way the playwright deepens the character of that girl and the people around her so that, in the end, every one of them makes a difference. If Bennett’s story is complicated and its concepts mature, none of that was lost on a crowd of teenagers at a field-trip performance Friday morning, where a chaperone had to hand out tissues to her sniffling charges at intermission. Yet there’s a serious undertone in the casual talk Nicole and her friends have about the book they’re supposed to be reading, Anne Frank’s Diary. Nicole’s parents don’t believe in the Holocaust, she says. Maybe way fewer than 6 million Jews were killed. Maybe it never happened at all. It’s only through some teenage lovelorn melodrama that Nicole suffers a bump on the head and is mysteriously transformed into Nicole Bernhardt, a Jewish teenager who lives with her parents and younger sister in German-occupied Paris in 1942. The play turns much darker, but Cadwallader’s young cast is mostly up to it – especially Alex Dyon as Nicole’s anxious friend David, Mackenzie Potter as her preteen sister and Eck and Little as her parents. Like those characters, the role of Nicole herself is relatively straightforward – silly one minute, sober the next. But Kathryn Nash makes the girl believable even if her fantastical journey back and forth in time requires a leap of faith. Too bad, then, that many of the young people in the cast don’t speak out loud enough to be heard in this cavernous-seeming theater space, where acoustics have always been a challenge. And too bad that a couple of inconsequential scenes (especially a modern-day dance number) go on too long. Scott Richard Ashley’s set morphs nicely from a teenager’s bedroom in 2011 to an elegant Paris apartment in 1942, and then to darker locations. But because of the configuration of the Universal theater’s thrust stage, it’s a shame that one or two of the play’s key scenes take place way upstage, far from the bulk of the audience. Yet the teenage audience with whom I saw the show was absolutely still and absorbed as the play turned darker and as the enormity of its message had its effect. Too often people believe that history is lost on the young. The Rep’s production of Anne Frank and Me proves that idea, this time at least, to be wrong. What: Orlando Repertory Theatre Sideways Series production of Cherie Bennett drama. Where: Universal Stage, Orlando Repertory Theatre, 1001 E. Princeton St., Orlando. When: 11 a.m. and 4 p.m. Saturdays, 2 and 5:30 p.m. Sundays, through Feb. 27). Running time: One hour 40 minutes, including brief intermission. Cost: $17 general, $15 over 55, $11 children. 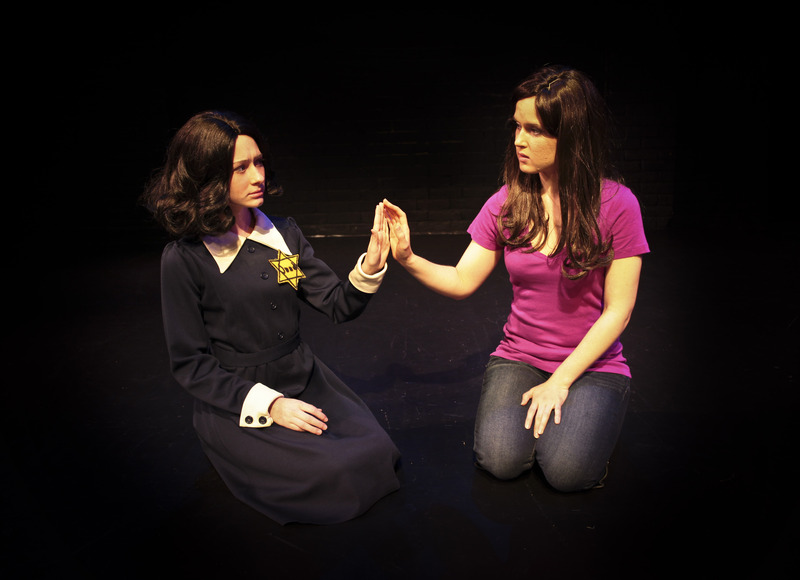 Photo of Chelsea Lynn Talmadge and Kathryn Nash by Eric Blackmore, courtesy of Orlando Repertory Theatre. An earlier version of this review had the wrong name for the actress who plays the younger sister. It is corrected here. This entry was posted in Children's theater, Orlando theater, Regional theater, Reviews, Uncategorized and tagged Anne Frank, Anne Frank and Me, Cherie Bennett, Holocaust, Jew, orlando repertory theatre, The Diary of a Young Girl: Definitive Edition. Bookmark the permalink. The play sounds absolutely wonderful…I wish I could see it.